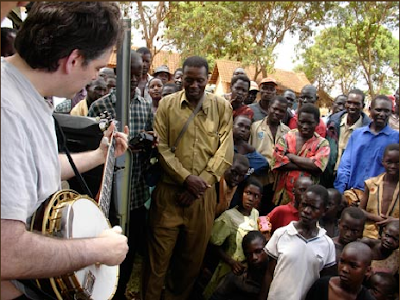 Tuesday night, about 350 lucky moviegoers witnessed a unique concert by banjo master Béla Fleck and his friend from Mali, n'goni player Cheick Hamala Diabaté. The pair played live in the Silver Theatre of the American Film Institute after a screening of "Throw Down Your Heart", a documentary about Fleck's journey through Africa in search of his instrument's roots, and part of the ongoing SilverDocs festival. 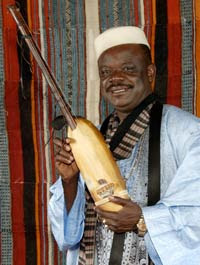 The n'goni is a three-string pluck-and-strum device and one of the ancestors of the modern banjo. Attired in a glorious Malian robe and kufi hat, Diabaté, a griot or musical storyteller, graciously acknowledged Fleck, the audience, and the presence of his country's embassy. Then he picked up his polished, hand-made instrument and sang songs of welcome and dancing. Fleck performed his usual wizardry, first accompanying the traditional music, then interpreting it into new, layered sounds. As Malian etiquette demands, a woman from the audience approached the pickers and showered them with money, which a smiling Diabaté tucked into Fleck's shirt before retiring from the stage. Fleck then rained down an inimitable solo medley that started with a Tanzanian tune and wound up with the theme from "The Beverly Hillbillies", the song that hooked him on the banjo as a child. The music from the movie, featuring dozens of other African musicians, should be available next year; details at www.throwdownyourheart.com.